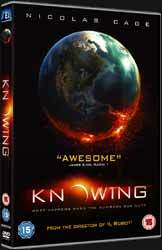 Knowing is a futuristic sci-fi thriller movie directed by Alex Proyas (I, Robot). While some will find this a dark movie with a bleak conclusion, in truth the thrust of the film is all about hope - hope for the future of mankind. After professor John Koestler comes into possession of a sheet of paper covered in numbers written by a girl 50 years previously, he soon discovers that it reveals the dates of major accidents. However, this document was written before any of the accidents happened. As John makes this discovery he realises that the document contains three more dates which haven't occurred yet - the last of which hints at destruction on a global scale. When John’s attempts to alert the authorities fall on deaf ears, he takes it upon himself to try to prevent more destruction from taking place. With the reluctant help of Diana Wayland and Abby, the daughter and granddaughter of the now-deceased author of the prophecies, John’s increasingly desperate efforts take him on a heart-pounding race against time until he finds himself facing the ultimate disaster and the ultimate sacrifice. Every now and then a movie comes along that not only impresses with a compelling plot, but has cutting edge effects that also heighten the enjoyment of the finished movie. Knowing is one such movie. It has a number of set pieces which should only really be seen on the large screen. The most notable is the incredible plane crash in which we see a plane fall out of the sky and then follow our hero as, without thinking, he runs towards the impact site to try and help anyone that might still be alive. This whole sequence is one long shot and looks simply amazing. Like John, the viewer is a little disoriented and not entirely sure what is going on. The handheld camera also helps to give this scene added realism - as though you're watching real video footage. Possibly the one aspect that will disappoint a lot of viewers (although not me) is the rather obvious E.T. / Close Encounters of the Third Kind scene near the very end of the movie. However, most will no doubt be won over by the movie's final scenes - which break away from the usual sci-fi Earth disaster movies of the past. I've said it before, and no doubt I'll say it again in the future, but having to review a DVD from a poorly presented review disc makes the whole viewing experience an unpleasant one. You'd think if DVD producers wanted a favourable review then they'd at least make sure that the review discs resembled the finished product. This single disc DVD arrived burned across three DVD-R discs. The first had the movie on with a timecode plastered across the top of the screen, the second had the movie with the audio commentary on it and the final disc had some, but not all of the extra features burned on it as one long video. The £22.99 price tag is also laughable - it's not even as though there are any really exciting extras. And, if the picture framing of the retail edition is the same as the review copy we received I wouldn't be happy paying over the odds for such a poor presentation - basically you're missing quite a bit of visual material from both the left and right of the screen. Extras include the aforementioned audio commentary with the director. I'm not entirely sure how they're going to present this on the retail release, but here poor Proyas makes the fatal mistake of pointing out his favourite audio commentary and the reason he likes it is the fact that the content is like an informal chat between the two participants. So step forward, who I assume is the producer of the commentary, who suddenly takes it upon himself to start asking Proyas questions. In reality, what he does is talk a lot of waffle and asks some rather naive questions which slowly starts to see Proyas refusing to answer them. In fact, most of the questions are worded in such a way as to attempt to show off how knowledgeable the guy is about film. I assume that on the finished disc the questions will be deleted, but that's going to leave a lot of dead air time. The other features include Visions of the Apocalypse (17 min, 12 sec featurette in which several 'experts' talk about the possibility of the World ending. In some of the interview segments the sound and picture was out of synch, which was a little distracting); and Knowing All: The Making of a Futuristic Thriller (12 min, 33 sec behind the scenes featurette. Worth watching for the background information and footage of the plane crash sequences). The press release also states that there will be the theatrical trailer and TV spots on the finished DVD, but as they weren't on the discs we received I can't comment on those. If the retail DVD edition is actually put out in the correct aspect ratio, and you can pick it up from one of the online stores for under £15, then I strongly urge you to buy this.